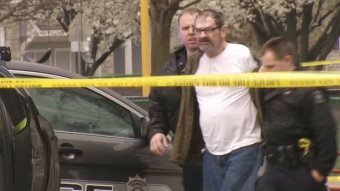 AFRICANGLOBE – The recent shooting deaths of three people near Kansas City by the noted Neo-Nazi Frazier Glenn Miller has refocused the public’s attention on the violent tendencies of the White Right in the United States. On a recent edition of her MSNBC show, Rachel Maddow concluded a segment on the Republican Party’s deep denial about (and active protection of) its violent “Patriot” and militia wing by asking the following question: why do we overlook right-wing violence and refuse to call it terrorism? The answer to Maddow’s question is simple. “We” don’t talk about right-wing domestic terrorists and other extremists because “they” are largely White and male. The language used by Rachel Maddow—and how it undermines the scurrilous Right-wing lie that there is such a thing as a “liberal media”—helps to demonstrate the above claim. Once more, a “liberal” news analyst talks around the obvious and is afraid to connect the words “White” and “male” and “conservative” in their discussions of White violence, murder, mayhem, and treason. Domestic terrorism is an oxymoron in America when White folks are involved. Whiteness imagines itself as kind, benign, safe, neutral, normal, and good. “Terrorism” is something those “other people” do, i.e. the Muslims, or some other ambiguous cohort of Black and brown people who “hate American values”. Whiteness and the White racial frame are possessed by an acute sense of historical amnesia as well. The most dangerous domestic terrorist organization in the history of the United States was the Ku Klux Klan, a group that killed thousands of Black Americans during the 19th and 20th centuries. Again, Whiteness has the ability to transform and shift empirical reality for its owners and those invested in it. Whiteness also grants White people in America the freedom to always be a blameless individual. By implication, White people, by virtue of their racial group membership, are incapable of ill deeds as a group. White people who do bad things are just “bad individuals”. Patterns of violence by White people, most notably mass shootings by White men, apparently tell us nothing about Whiteness or White masculinity. Patterns of behavior that should be the basis of a critical inquiry about White culture (a logic that when applied to Black people inevitably returns to questions of “pathology” and “bad genes”), is a question that cannot be asked by the mainstream media, or in “polite” circles, as it is considered impolitic. 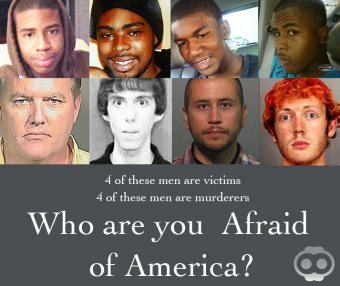 Because White people imagine Whiteness as normality, to even explore the relationship between race and domestic terrorism is an intolerable offense or social sin that fuels the howls of White conservative victimologists and their knee jerk claims of “reverse racism” and “bigotry” against gun loving American “patriots”. Whiteness is also a type of mass psychosis, one that is predicated on a rubric that those people now considered White can have their racial identity revoked retroactively if they commit acts which are not in accordance with how White America envisions itself as viewed through its own narcissistic gaze. Ignoring the various pathologies of Whiteness as exhibited by White domestic terrorists is just one more example of how Whiteness hurts White people through a slavish devotion to the profound lie that to be a member of the racial group arbitrarily defined as “White” is to thus be preternaturally good and harmless. The bodies of many White children have been laid out at room temperature on the funeral slab because of that “innocent” White lie. In 1860, “Ethiop”, an African-American social critic and satirist asked “what shall we do with White people?” The murderous escapades of Frazier Glenn Miller, the growth of White militias, the violent and seditious rhetoric of the Republican Party in the Age of Obama, Birtherism and other types of deranged and paranoid political fantasies on the White Right, and mass shootings and well as other terrorist acts by White men, reinforce the need for asking that question in the present moment. Of course, there will be no “national conversation” in the United States about “White cultural pathologies”. How can there be when White people, by definition, are the embodiment of the universal and supreme individual, one for which accountability and questions about “bad culture” are anathema and impossible to consider?